Are Android and Chrome OS coming together for real this time? Some thoughts and a theory on how a string of saucy new rumors could play out. Ah, the Android-Chrome OS merger. It's the fascination that just won't fade away. We've been hearing predictions about Google's two primary platforms coming together for ages now -- and every time, the reality ends up being far more nuanced than the prophecies lead us to expect. Rather than the one-or-the-other, winner-takes-all type of duel folks have been forecasting for ages, Google has thus far been set on aligning the two platforms and allowing them to co-exist in a mutually beneficial manner. That foreshadowing set off a flurry of stories about "Andromeda," an apparent code name for an effort within Google to "fold" Chrome OS into Android -- in a way that goes beyond the level of alignment we've been seeing so far. The website Android Police kicked the whole thing off with a report revealing the alleged effort and suggesting it was the only thing with enough historic significance to justify Lockheimer's lofty comparison. Since then, other websites have uncovered evidence of Andromeda's existence within Google's open source Android code. And there's more: Android Police followed up its initial report with additional details about an apparent "Pixel 3" device being planned for late 2017. The product, according to the site, would be a convertible laptop-like device designed to show off how the new software could work across different form factors. If all of that isn't enough, the website 9to5Google now says a second new device, made by Huawei, is also in the works with planned support for the hybrid Android-Chrome OS. Whew -- that's a lot of spicy sausage to nosh on. Take a minute to digest, then let's think about how this could actually all make sense. Back with me? Good. 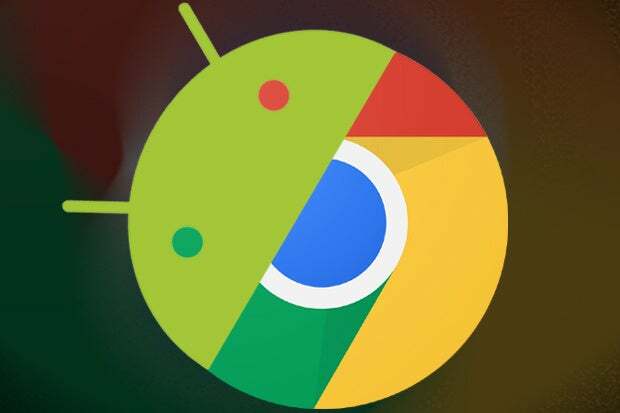 Now, as you can probably imagine, I've been doing a lot of noodling over these new rumors and how they could coexist with everything we already know about Google's current Android and Chrome strategies. JR: We've obviously seen a lot of convergence between the two [platforms], with design and features overlapping. Would it be safe to say that it's maybe not a binary thing -- that they could share qualities but still continue to coexist? [That] it doesn't have to be one or the other, as some people are positioning it? HL: That's exactly right. It's definitely not binary. In fact, they coexist beautifully today. ... [Chrome OS and Android devices] work great together, and it's not like I have to choose one or the other. They serve different needs. That's how we see it, and I think that's how it will continue to be going forward. We'll bring good attributes from both -- so for instance, the example of running Android apps on Chrome, that's bringing an attribute of Android over to Chrome. And maybe there are attributes of Chrome OS that we bring over to Android, and so on. That's how we're seeing it, so definitely not a binary sort of switch-transition type of thing. So how does that declaration live alongside the notion of Chrome OS being "folded" into Android? And beyond that, what's even left for Android to gain from Chrome that's significant enough to create a whole new branch of the software? Remember, Android already adopted one of Chrome OS's most prominent features: the platform's seamless method of applying software updates, which came into Android as part of this year's Android 7.0 Nougat upgrade. What more could it incorporate that'd go beyond just being another bullet point on next year's list of new features? I've come up with one intriguing possibility. And while I'm not generally one to indulge in the guessing game, it's an interesting enough theory that I thought it'd be worth sharing -- even if it does prove to be no more than a hypothetical exercise. Just to be crystal clear: None of the following thoughts are based on any sort of insider info. I'm just trying to put all the elements that are in front of us -- both the new leaks and the existing facts and statements -- together in a way that adds up logically. In other words, don't think about this as a "This will happen!" story but rather as a "Wouldn't it be interesting if this happened?" proposal -- a fascinating possibility to mull over as we wait for the full monty of info to appear. So, that being said: What if Andromeda were essentially just a way to give Android devices a "desktop mode" -- a Chrome-OS-like environment that appears when, say, a physical keyboard is present, with a more traditional Android interface remaining in place for touch-centric use? A Chrome OS-like environment wouldn't be ideal as a core part of the regular touch-centric Android experience, after all, but it sure could be valuable as an option for scenarios involving more productivity-oriented and laptop-like use. And what if this best-of-both-worlds, dual-purpose mentality applies not only to convertible systems but also to phones? Maybe even phones like, ahem, the new Pixel devices Google is expected to announce next week -- you know, at the same event where all this Andromeda business is rumored to make its grand debut? Such a setup could effectively turn any compatible Android device into a versatile all-purpose computer that packs the strengths of Google's two platforms into a single superpowered package -- kind of like what Microsoft is doing with Windows 10's Continuum concept, only with the world's most popular mobile operating system and all of its apps involved. It'd be pretty darn monumental. And it could conceivably allow each platform to continue to exist independently as well as within the new combined form (something that's particularly significant when you consider the strong demand for both inexpensive lower-end phones and cost-effective standalone Chromebooks). Everything Hiroshi Lockheimer has said, as outlined above -- all the comments about bringing the best attributes of each operating system into the other without forcing either one to go away. Go back and listen carefully. It all adds up. The mysterious disappearance of Google's second-generation Chromebook Pixel late last month. The laptop still has cutting-edge specs and top-notch design, and seeing it vanish after just over a year on the market seems rather strange on the surface. It's not a device that warrants a refresh every year (the first-gen model stayed on sale for about two years before it was replaced), and there are no signs of a third-gen model being released anytime soon. The Chromebook Pixel isn't a device that's ever been positioned as a huge seller, but its presence has always served a purpose for Google. Something conceptual had to have changed for it to be taken off the market, and the timing here sure seems awfully curious. On the flip side: the continued sale of Google's Pixel C convertible Android tablet. Something about that tablet seemed off since its launch -- like it was meant to do more than what we were seeing. And sure enough, evidence suggests the device was once tested with an under-development alternate version of an operating system resembling Chrome OS. Could a dual-purpose OS like Andromeda be the Pixel C's ultimate destiny -- the missing piece that'll finally make the tablet feel complete, with an Android-like environment when it's used as a slate and a Chrome OS-like desktop when it's used as a laptop? Now, that'd be a convertible worth owning. The presence of Android apps on Chromebooks -- something that, notably, just made its way into the stable channel of Chrome OS this past week (prior to then, you had to be running the more advanced beta or developer channels of the operating system in order to find the feature). With such a possibility in the picture, you could have a somewhat cohesive experience across this interpretation of Andromeda's two environments, as all the stuff from your phone would be readily available and able to run within the Chrome OS-like "desktop" environment. The rumored price of the new Pixel phones, which is $650 (unlocked) at the base level. If accurate, that figure on its own seems somewhat surprising. Google almost certainly isn't looking to become a company that makes its profits directly by selling hardware. It experimented with high-end prices with 2014's Nexus 6, and by most accounts, that didn't go terribly well. The company went back to value-level prices with last year's Nexus 5X and 6P, and the bar for unlocked phone prices has only fallen further since that point. All of this is to say that it seems quite illogical for Google to suddenly backtrack and go with a 2014-level high-end price on its 2016 flagship phones. But, assuming that price proves to be correct, maybe there's more to the story. Maybe $650 is justified by the presence of unusual dual-purpose capabilities -- or even the inclusion of some special kind of hardware connected to that capability. The ad for Google's upcoming October 4 event. I hate to read too much into tea leaves, but Google spent an unusually high amount of effort on this campaign -- and it only stands to reason that it also spent a fair amount of time considering how it could cleverly tease the appropriate message. Once you've seen it, it's impossible to miss: The graphic absolutely appears to be illustrating a continuum (to borrow an appropriate term). Coincidence? Before we wrap up, let's step back for a second and consider this in the big picture -- because, it's worth re-emphasizing, all we're doing here is imagining one way a purely hypothetical situation could end up coming together. It's entirely possible this is all off-base and that Google is merely going to mention Andromeda as a "one more thing"-style tease separate from its immediate hardware launches (if it even mentions it at all, of course; as of now, this entire discussion is based on unofficial info and conjecture). But think about it: A random and detached preview of some new hybrid OS at next week's Google event would totally steal the show. It's all anyone would talk about or write about for weeks, leaving the phones and any other announced hardware as barely noticed afterthoughts. That's presumably not what Google wants to happen. If Andromeda (or whatever it might end up being called) is going to be mentioned at all, it sure seems like there'd have to be some sort of connection between it and some of the immediately launching products. There's one other elephant in the room to address: Dual-purpose devices have been tried before in the realm of Android -- both with phones (anyone remember the Motorola Atrix?) and with tablets (a la the Pixel C). And by and large, they've never been particularly great. But here's the catch: The problems with those devices have revolved almost exclusively around software. Plain and simple, the products were limited to running regular ol' Android on the desktop end -- software that, no matter how you look at it, just wasn't designed for productivity-heavy desktop-style use. Chrome OS, in contrast, is designed for exactly that purpose. Combined with Android's touch-centric strengths, it could be the missing piece that makes this puzzle work. And that leads us to our final question: Why do all of this? Well, that part's easy. What Google ultimately wants as a business is to do whatever it can to keep people using the internet and thus Google services as much as possible, regardless of the context, environment, or specific needs. And getting people on board with powerful all-purpose devices that excel at both touch-based browsing and keyboard-centric computing would certainly help to accomplish that goal. On their own, Chrome OS and Android are each great at one type of use and kinda-sorta-okay at the other. Together, they'd be the total package. Whew. Lots to think about and to be learned -- and lots of questions that may or may not be answered right away. More than anything, lots of possibilities and uncertainty. Despite all the recent leaks, after all, there are no doubt more pieces to this puzzle that have yet to be uncovered. However this all shakes out, one thing's for sure: Here in the land of Android, we've got some seriously interesting times ahead.